Helena Ravenclaw (known after death as the Grey Lady; late 10th century — early 11th century) was a witch and Rowena Ravenclaw's daughter. She attended Hogwarts School of Witchcraft and Wizardry and was Sorted into Ravenclaw house. At some point, she stole her mother's diadem and ran away to Albania. Rowena became fatally ill, and hoping to see her daughter one last time, sent the Bloody Baron, a man who harboured an unrequited love for Helena, to find her. The Baron killed Helena when she refused to return with him, before killing himself out of regret for what he had done. She and the Baron eventually returned as ghosts to Hogwarts Castle, where Helena became and continues to be the Ghost of Ravenclaw House. Helena Ravenclaw: "My mother's diadem —"
Helena Ravenclaw: "When I lived, I was Helena Ravenclaw." Helena was born into the wizarding Ravenclaw family, to Rowena Ravenclaw, no earlier than 982 somewhere in the British Isles. At the age of eleven, Helena became part of one of the first generations of students at Hogwarts School of Witchcraft and Wizardry in Scotland, which, at that time, was still being run by its original Founders. She was Sorted into Ravenclaw House and was educated in the magical arts by her mother during the seven years that followed. Around this time, she met the Baron of Slytherin house. He fell in love with her, though she always rejected his advances. Helena never found true love as she never found anyone that lived up to her standards. Helena Ravenclaw: "I stole the diadem from my mother." Harry Potter: "You — you did what?" Helena Ravenclaw: "I stole the diadem. I sought to make myself cleverer, more important than my mother. I ran away with it. My mother, they say, never admitted that the diadem was gone, but pretended that she had it still. She concealed her loss, my dreadful betrayal, even from the other founders of Hogwarts. Then my mother fell ill — fatally ill. In spite of my perfidy, she was desperate to see me one more time. She sent a man who had long loved me, though I spurned his advances, to find me. She knew that he would not rest until he had done so." Envious of her mother's cleverness and importance, Helena stole her diadem and left Scotland, believing the item could help her become wise enough to accomplish her goals. Ashamed of her daughter's betrayal, Rowena Ravenclaw never admitted her daughter's treachery, hiding the fact that the diadem was no longer in her possession. Having fallen fatally ill and on her deathbed, Rowena desperately asked the Bloody Baron, who was deeply in love with Helena, to find her daughter and bring her back to her so that she could see her one last time. Helena tried to hide from him, but the Baron managed to track her down to a forest in Albania. When she heard the Baron blundering through the forest toward her, she hid the diadem inside a hollow tree. Helena refused to come with the Baron and rejected his affections and he stabbed her in a fit of rage. After seeing what he had done, remorseful of his action, he stabbed himself to death. Helena, now known as the "Grey Lady", returned from the dead as ghost along with the Baron. They both returned to Hogwarts Castle, where they became the house ghosts of their former Houses, Ravenclaw and Slytherin. The Baron has been remorseful of his actions ever since, and carries heavy chains as a sign of penance. Nobody else seems to know why both of them died nor why the Baron is covered in blood, not even the other Hogwarts ghosts. According to Ravenclaw Prefect Robert Hilliard, while the most of the school sees the Grey Lady as a timid ghost, she maintains a good relationship with members of her own House and is particularly useful if they were lost, or had mislaid something. Harry Potter: "You've already told someone this story, haven't you? Another student?" Helena Ravenclaw: "I had… no idea… He was... flattering. He seemed to… understand… to sympathise…"
Harry Potter: "Well, you weren't the first person Riddle wormed things out of. He could be charming when he wanted…"
During the last few years of Tom Riddle's education at Hogwarts School of Witchcraft and Wizardry, he became interested in the subject of Horcruxes. Planning to create some in an effort to become immortal, Riddle favoured objects worthy of the honour. He apparently heard of Ravenclaw's diadem, and questioned the Grey Lady about it. Tom traveled to Albania to turn the diadem into a horcrux. Unaware of Riddle's true intentions, the Grey Lady found him flattering and understanding, but seemed to regret revealing her secret to him after his atrocities in the First and Second Wizarding Wars. On 1 September, 1991, the Grey Lady attended the Start-of-Term Feast. She arrived accompanied by the ghost of the Cavalier, and stayed by the Ravenclaw table over the Sorting ceremony. Later in the year, Sir Nicholas de Mimsy-Porpington told the Grey Lady how Harry Potter was made Seeker for Gryffindor. On 26 December, Harry Potter took Ronald Weasley with him to the storeroom containing the Mirror of Erised. On their way and under Harry's Invisibility Cloak, they passed the Grey Lady. On 4 June, 1992, the Grey Lady seemed to have attended an advanced-students' Transfiguration class, and sat taking notes on one of the desks after the class was dismissed while Professor McGonagall wrote some notes of her own on her desk. On the evening of 14 February, the Grey Lady sat at Gryffindor Tower reading a book. By 1995, there was a tetraptych depicting Helena Ravenclaw hung in the hallway outside the Hogwarts Library. The Grey Lady could be usually seen strolling along this corridor this school year. On 1 March, 1997, after Ronald Weasley was in the hospital wing after drinking poisoned mead, Harry Potter, Rubeus Hagrid and Hermione Granger passed by the Grey Lady, who "drifted serenely past" while talking about the Board of Governors and the closure of the school given the recent attacks on Katie Bell and Ronald Weasley. Albus Dumbledore, Headmaster of Hogwarts, was killed at the hands of Severus Snape in the former's plan on 30 June, 1997. The Hogwarts ghosts were known attendees of his funeral in early July; this likely included Helena Ravenclaw. Helena Ravenclaw: "You are hardly the first student to covet the diadem. Generations of students have badgered me —"
Harry Potter: "This isn't about trying to get better marks! It's about Voldemort — defeating Voldemort — or aren't you interested in that?" Helena Ravenclaw: "Of course I — how dare you suggest —?" Harry Potter: "Well, help me then!" On 1 August, 1997 the Ministry of Magic was taken over by Lord Voldemort's Death Eaters.By 1 September, 1997, Severus Snape was made Headmaster of Hogwarts while his fellow Death Eaters, Alecto Carrow and Amycus Carrow became the Muggle Studies and Defence Against the Dark Arts teachers respectively. The Carrows were put in charge of all discipline and punishments, which were violent. It is likely that the Grey Lady, as did the Heads of House, tried to protect the pupils from Alecto and Amycus. On 2 May, 1998, the Battle of Hogwarts ensued after Lord Voldemort learned Harry Potter was in the premises. The ghosts, including the Grey Lady, attended a gathering in the Great Hall, in which Professor McGonagall gave instructions on evacuation of underage students and Kingsley Shacklebolt organised the participants for battle. Harry Potter, needing information on the whereabouts of Rowena Ravenclaw's Diadem, asked Nick who the ghost of Ravenclaw Tower was. Although he was initially slightly hurt that Harry needed another ghost rather than him, he pointed her out to him. She was initially reluctant to convey any information on the diadem's whereabouts, thinking that Harry sought the diadem in a desperate (and vain) attempt to sharpen his wits and thus increase his chances of defeating Lord Voldemort. However, letting it slip that she was Ravenclaw's daughter and learning that the diadem could be effectively used in Voldemort's destruction, she conveyed to Harry all necessary information for him to be able to figure out where Voldemort had hidden the diadem, therefore destroying nearly all the Horcruxes. Later on, the ghosts gathered at the Great Hall, joining the mass mourning over the fallen. After the death of Lord Voldemort, the Grey Lady might have joined the party. Helena was a tall witch with waist-length hair. She wore a floor-length cloak. Harry Potter "supposed that she was beautiful," but had trouble seeing through her proud and haughty appearance. She carried herself in a serene manner. A highly intellectual young lady, Helena was a scholarly, literary, and cultured woman. Close to one-thousand years after her death, she still maintained her intellectual curiosity, enjoying attending Transfiguration classes and reading. Helena was described as an intelligent lady. She had high standards and never bothered in love due to this. She was also evasive, as she did not appear to like telling others about her past (not even that she was Rowena Ravenclaw's daughter) and somewhat taciturn. She also had a preference to secluded places: she hid in a forest when she ran away from her mother, hung around in deserted classrooms, and chose a deserted Gryffindor Tower as a reading spot. Despite all this, she had a thirst for importance and notability and was, as such, very envious of her mother. "Helena" is a Latinate form of Helen, derived from Greek ‘ελενη (eleni) which means "torch" or "corposant" (source of light). Eleni was the name of a saint in the Greek Orthodox Church, and as such there are many girls and women in Greece with that name. Many Grey Lady ghosts are known in various locations throughout England and Wales. Nina Young was the actress who portrayed The Grey Lady in the film adaptations of Philosopher's Stone and Chamber of Secrets. 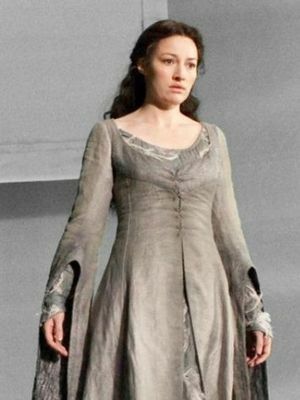 In Harry Potter and the Deathly Hallows: Part 2 she is portrayed by actress Kelly Macdonald. Kate Winslet was reportedly offered the role, but her agent turned it down. While working on the earliest drafts for the books, J. K. Rowling had originally named her the "Whispering Lady". J. K. Rowling has stated that The Grey Lady appeared very briefly in Harry Potter and the Philosopher's Stone. It is believed this passage refers to her: "Harry and Ron passed the ghost of a tall witch gliding in the opposite direction, but saw no one else". No other unexplained mention of a ghost is found in the book, so it can be presumed this is the Grey Lady. Likewise, in Harry Potter and the Half-Blood Prince, a reference of a "ghost of a long-haired woman [who] drifted serenely past" fits almost perfectly with the description of the Grey Lady in Harry Potter and the Deathly Hallows. The Grey Lady makes a notable appearance in the deleted scenes portion of the Chamber of Secrets DVD (when Harry is finding the secret of Tom Riddle's Diary, he asks her to leave, wanting privacy). It seems rather strange that the Ravenclaw ghost is allowed in Gryffindor Tower. However, being a ghost, she could go everywhere. There are a number of Grey Lady ghost stories of Great Britain, and it is thought that they might have been an inspiration for this character. In the PC version game of Harry Potter and the Goblet of Fire the Grey Lady appears in the Clock Tower. In Harry Potter and the Deathly Hallows: Part 2 and LEGO Harry Potter: Years 5-7, Helena has a friendship with Luna Lovegood which is not mentioned in the books. The Grey Lady is the only house ghost whose nickname isn't alliterative. A ghost woman with long brown hair passes through the Defence Against the Dark Arts classroom during Quirinus Quirrell's Knockback Jinx lesson in Harry Potter and the Philosopher's Stone (video game) which is possibly the Grey Lady. Kelly Macdonald and Shirley Henderson, who played another Hogwarts ghost Moaning Myrtle, played sisters in the film Intermission. ↑ 1.0 1.1 Given Hogwarts was founded in around 993 A.D. and that Helena attended it within Rowena Ravenclaw's lifetime, she must have been eleven by or after the school's founding. So, the earliest date she could have possibly been born is 982. ↑ The Baron killed her after her seven years at Hogwarts, and given the earliest she could have started at the school is 993, her earliest possible death year is 1000. ↑ Helena's mother, Rowena Ravenclaw, was a witch. Therefore, Helena could not have been anything less than a half-blood. This page was last edited on 7 July 2015, at 14:33. This text is available under the GNU FDL and may have been adapted from the Wikipedia article about Helena Ravenclaw (history).